It was a brilliant day on Saturday at University of Baltimore where Jimmy Gardner and I kicked off the inaugural WordCamp Mid-Atlantic. I have been to half a dozen or more WordCamps since the first one in San Francisco in July of 2006. Without being at all conceited, because it had nothing really to do with me, this was the best one yet. Let me back up for a moment and paint a picture of the landscape we dealt with in organizing this event. From the outset, I explicitly gave the event a number of roadblocks. More so, I gambled a lot with the event. For one, there has never been, to my knowledge, any WordCamp event that has been focused to a region, and not a city. Even events branded to a country, such as WordCamp China, were really still city-specific (Shanghai in that case). The original organizer of our event was going to place it in DC and brand it WordCamp DC. I had a fundamental problem with this idea because DC has enough of a social media presence already, and I felt like there was talent, knowledge and community to be tapped into in the larger region. City-based events tend to reinforce the already existing city-community norms and creates silos. I’m all about connecting silos (a theme that would be echoed throughout the event). So when I took over as the organizer, I moved it out of DC and rebranded it as WordCamp Mid-Atlantic with an express intention of marketing it to not only DC, but also Baltimore and Philadelphia – cities that have their own unique personalities, experiences and perspectives. As a rider to the first challenge, I also intentionally placed the event in Baltimore. Some people questioned the wisdom of this, and in fact, Matt Mullenweg gave me a bit of a hard time at last years San Francisco event for wanting to do the event in Baltimore (it was before there were active plans). Baltimore suffers a negative perception syndrome as a unattractive, petulant younger sibling of Washington, DC – a city filled with sexiness and stature. However, Baltimore has its own unique identity that is emerging. Thanks in large part to serial entrepreneur, David Troy, things are actually beginning to develop in the city. From a vibrant co-working community, Beehive Baltimore to the Baltimore Angels Network, a group of local businesspeople looking for great ideas to get behind and fund. Juxtapose this emerging community against a central location between Washington and Philadelphia, ease of transportation via BWI or the Amtrak station across the street, the state of the art University of Baltimore Business Center – it made complete sense to support that city. The third challenge I faced immediately was the decision to invite Anil Dash, a Senior Vice President and co-founder of WordPress rival SixApart. I knew I wanted Anil to come speak to our community for a number of reasons I will get into later. I also knew it would create controversy and setup certain scenarios where members of the greater WordPress community might criticize or outright disparage our event. It was a choice I made for intentional reasons. More on that in a bit. If it was possible to have an event go off seamlessly without a single technical glitch (including persistent wifi throughout the day), I would not have known. Since I go to events, conferences and unconferences around the country, I have a fair degree of experience in these things. It doesn’t ever happen. EVERY conference organizer will tell you that wifi is always a problem. That issues like laptop hookups never work all the way through the day. That schedules are kept. 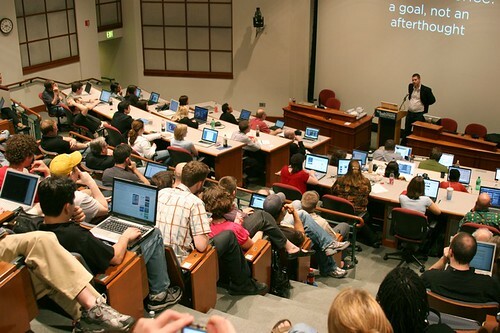 That audiences always engage. That attendence was 110% fill rate. These things don’t happen. Ever. Wireless always breaks. Somebody is bound to not be able to get the A/V equipment working so that their presentation can be used. Sessions always run over and organizers are always left scrambling to figure out how to get back on schedule. Crowds get bored and wander for food or cigarettes during sessions. Speakers aren’t dynamic enough and tend to be boring. None of this happened this weekend. None of it. And whoa… I have no idea how, but I’m not arguing. Thank you all for helping us stay on target. As part of the original push to support the local Baltimore community, I also asked the Ignite Baltimore folks to come and host a mini-track of presentations, one between each session. Ignite Baltimore co-host, Patti Chan of 600Block MC’d these talks. Sidenote: For those not familiar with Ignite, speakers are given 5 minutes to do a presentation with 20 slides, each of which automatically advances after 15 seconds. They are lightning talks, and the speakers are dynamic, insightful and passionate. Throughout the day, these Ignite talks were provided as a way to break things up, give WordPressers something else to think about – such as running a startup, culture and art, and even applying an Agile development methods to lifestyle. It worked, and it worked beautifully. Thank you, Patti and crew. 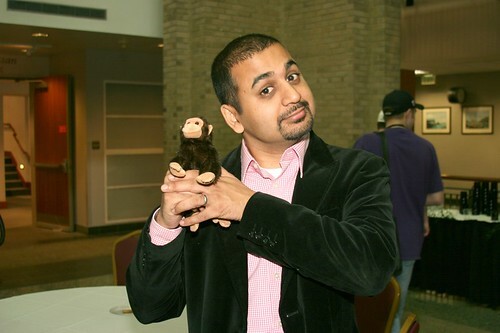 Of course, the elephant in the room for this whole thing, was Anil Dash kicking the day off with a keynote. Based on historical angst, this was somewhat akin to inviting a wolf into the hen house. However, I know that there is a symbiosis between the rival SixApart suite of products and WordPress’ suite of products. When I reached out to Anil to pitch him on the idea, my idea was… let’s talk about what SixApart is learning from WordPress and how the two are collaborating. Anil took it a step farther. He spoke of islands of networks, where a single blogger could create their own community or social network by using BuddyPress or Movable Type Community. Yet that only solves technical problems. It does not address issues that arise from lack of connectedness. He spoke about how our communities really are very similar because we all love blogging and want to see the medium thrive. He then went on to announce the release of a suite of plugins that SixApart is releasing for WordPress. This kind of symbiotic relationship is not new. When Automattic released the highly popular Akismet anti-spam plugin, the first non-WordPress version was for Movable Type. Of course, Automattic properties IntenseDebate and PollDaddy can also be used transparently anywhere on the web, whether on TypePad, Blogger or Expression Engine. Historically, SixApart hasn’t done all that much outside of their own suite of products and though they admit to needing to do more, they are now making their efforts to cross over platforms and reach out to the greater community. What’s good for blogging is good for both WordPress and the SixApart platforms. Frankly, Anil came into the lions den needing to play nice, balanced the entire day extremely well, knocked the ball out of the ballpark by being extremely embracing of our community, putting the questioning crowd at ease with humor, style and grace and gave us something productive. Anil tells me this is only the beginning. I say, don’t discount SixApart. If you’re a WordPress user, developer, theme designer or simply an interested onlooker – don’t discount these guys. We are all in this thing together. Frankly, sometimes MovableType is a better solution than WordPress. Sometimes it’s Drupal, though it’s never Joomla (Sorry, Joomla folks :-)). As a note, the entire keynote was captured on video and can be seen here. I’d like to send another shout out to our sponsors, Network Solutions, JESS3, Amplify, Blue Sky Factory, Groove Commerce, WebDevStudios, SkinnyMinnyMedia, Margaret Roach, The Sister Project, iStrategyLabs, AwayFind, Mingle360 and Sticker Giant. It was a truly unbelievable day. I let this slip on Twitter so I might as well acknowledge it. We are tentatively targetting May 8, 2010 for WordCamp Mid-Atlantic 2010. Please subscribe to wordcampmidatlantic.com to be notified when tickets go on sale later this year. 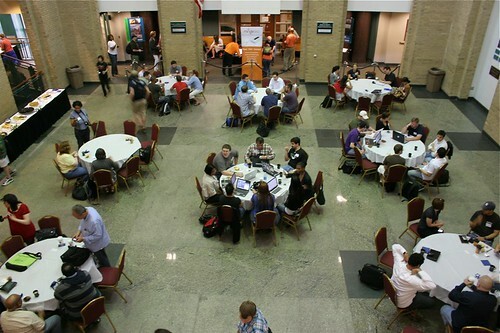 * All Photos were taken by Dawn Casey, dubbed the official photographer of WordCamp Mid-Atlantic. To view the whole set and find more of her work, please visit her Flickr page or read her recap of this event from a photographer standpoint.